Western blot analysis of mouse Mogat2 polyclonal antibody ( Cat # PAB2354 ) in HL-60 cell line lysates ( 35 µg/lane ) . 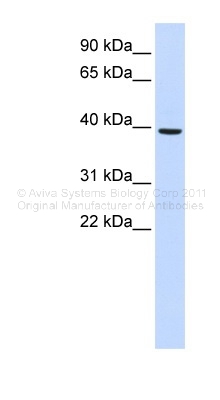 Moga2 ( arrow ) was detected using the purified polyclonal antibody ( 1 : 60 dilution ) . Western blot analysis of mouse MOGT2 Antibody (C-term) (Cat.#AP11156PU-N) in HL60 cell line lysates (35ug/lane). MOGT2 (arrow) was detected using the purified Pab (1:60 dilution). (0.05ug/ml) staining of Human Duodenum lysate (35ug protein in RIPA buffer). Primary incubation was 1 hour. Detected by chemiluminescence.